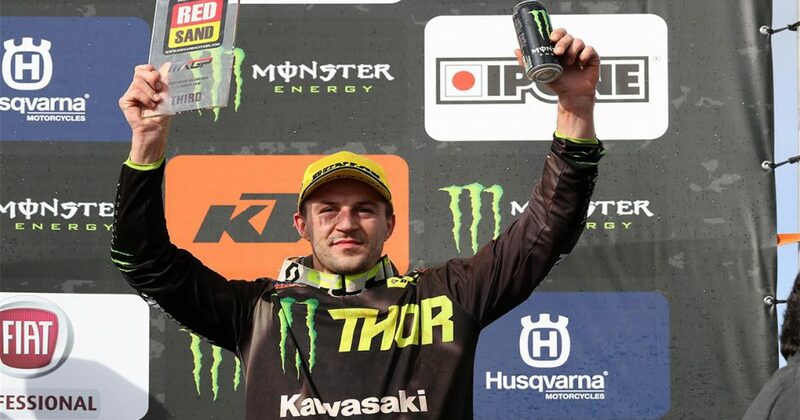 Clement Desalle of the Monster Energy Kawasaki Racing Team reinforced his third place in the FIM World MXGP Motocross Championship with his second podium in the three rounds of the series run to date. The Belgian turned round a disappointing performance in qualification at the Red Sand facility one hundred kilometres north of the Spanish Mediterranean port of Valencia in a confidence-building performance as he raced in the leading group in both point-scoring races. Rider and team found an excellent solution on the set-up for the starts overnight and he was able to start fourth before quickly taking over third in race one, holding it until an intense mid-race challenge from the series points leader cost him one place in the later stages of the race. Despite not starting quite so well in race two he was quickly able to push forward to third place again and held the position with confidence until a late challenge from the series leader again saw him take the chequered flag in fourth position. This was sufficient to claim third overall on the day and strengthen his third place in the series standings. KRT teammate Julien Lieber also made his best performance to date in his rookie season in the MXGP class, racing to seventh overall. His first moto ride was particularly impressive as the twenty-three year old put in two strong passes late in the race to finish fifth and he again rode with great confidence in race two to advance from an initial fourteenth after an incident with another rider to take the chequered flag ninth. The two strong performance also sees him move into the series top ten. Maxime Desprey and Alessandro Lupino of Gebben Van Venrooy Kawasaki Racing each scored nine world championship points in Spain and now hold seventeenth and eighteenth placings in the series.